There are many books on prayer. For the most part I agree with them. I agree I should pray. I agree that I should pray more. I agree with the purpose of prayer most books lay out. This short book doesn’t deal with any of that. 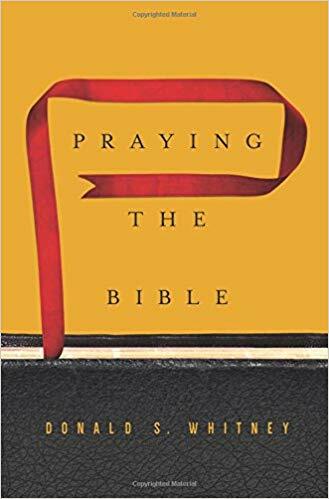 Rather, this book first confronts a problem many of us face when it comes to prayer… what should we pray and how do we keep our prayer life from being stale and repetitive. The solution, according to Donald Whitney, is to begin praying through the Bible, specifically the book of Psalms. At first I wasn't too impressed. But as Whitney continued to unpack the purpose and power of praying through the Psalms, I began to warm up to the idea. Towards the end, Whitney asks the reader to try it. I picked Psalm 27 and set my timer for 7 minutes (his suggestion). That’s when I really began to like it. Since the Psalms is the prayer and praise book of the Bible, it would make sense for us to use these prayers as a springboard for our own communion with God. In the end, Whitney shows that many great men in history (George Mueller, John Piper, Charles Spurgeon), as well as the early church (Acts 2), and even Jesus on the cross used the Psalms to pray through. I look forward to employing the method more in my life going forward.